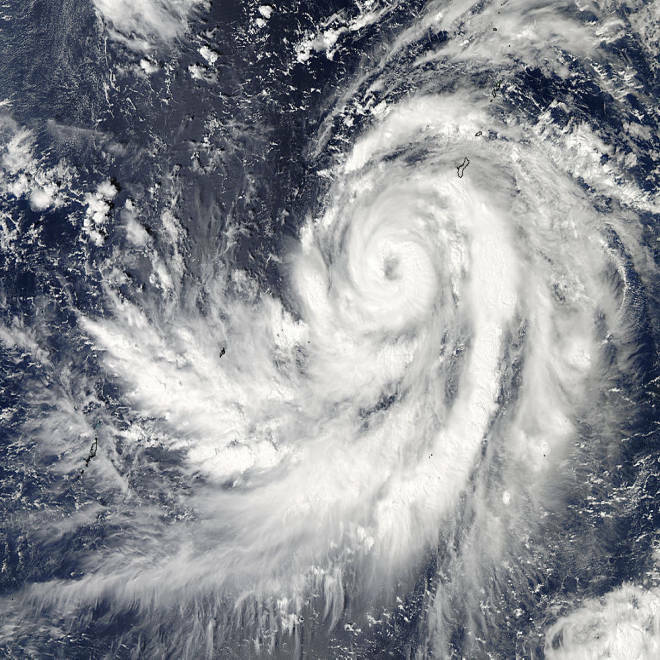 Typhoon Francisco over the Western Pacific in a satellite image. Typhoon Francisco skirted west of Guam on Friday following the same path as Typhoon Wipha, which killed 17 people in Japan this week. The U.S. Pacific island remained on highest alert with most government functions shut down as tropical-storm-force wind and rain lashed its west coast. At 11:20 a.m. (9:20 p.m. Thursday ET), Francisco, a category 2 storm, was about 125 miles west of the island and was moving northwest at 10 mph. The National Weather Service said the storm had unexpectedly maintained its strength as its eastern edge hit the island, and a tropical storm warning remained in effect. Sustained winds of 40 mph were expected to continue through the afternoon, with gusts above 50 mph. Sea levels were 5 feet above normal as the storm dropped heavy showers across the island. The government was closed, along with all schools and banks, after Gov. Eddie Calvo declared a Condition of Readiness 1, the highest alert. Guam's three U.S. military bases, which follow a different standard, were at moderate alert, with only some non-essential services suspended, the Navy said Friday morning. Visiting hours were suspended at Guam Memorial Hospital, but the hospital was accepting patients, and all late-term pregnant women were asked to check in so they wouldn't be stranded if they went into labor. The hospital said it would admit all such women until it was safe for them to return home. "We are expecting the worst of the weather to pass around 3 p.m.," Phill Leon Guerrero, a spokesman for Calvo, told NBC station KUAM of Hagatna. "At this point, it is a wait-and-see thing, and we want to make sure that the typhoon moves as predicted." Francisco was expected to regain strength as it traveled over the open waters of the Western Pacific over the weekend on a very similar course to that taken by Typhoon Wipha, the National Oceanic and Atmospheric Administration said. Wipha made landfall on Japan on Wednesday morning with winds of up to 110 mph, causing floods and mudslides that killed at least 17 people.